This really has been an interesting week. I commented that I had won a metalsmithing course and I have been gathering up the supplies I need. I actually used a day of vacation to give me a chance to do so and play in the studio. Well playing in the studio I did and I finally managed to get what supplies that I need gathered up. I just didn't get a chance to combine the two. What happened instead was the city decided to flush the water main. Great in concept but it blocked up our pipes. We have been working on getting that fixed so I haven't had a chance to actually get down and play with soldier and my torch. Hopefully this weekend. Now what my muse fixated on was a necklace for a blog hop that isn't until this summer. So off we went. Once that was finished, I made up a matching pair of earrings. Finally Serenity, my muse, decided to cooperate with me on the theme. And she demanded a pair of earrings. 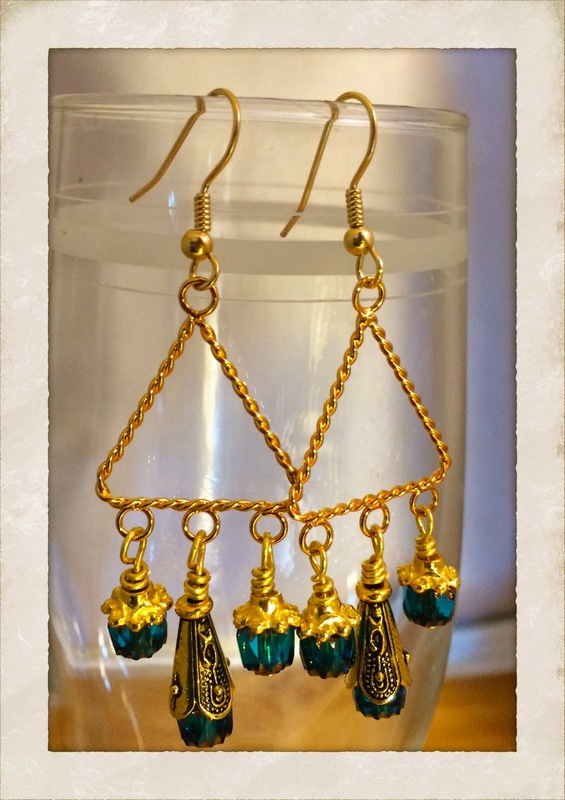 This pair was made using Czech Cathedral beads that are a beautiful teal color. The findings are golden color pewter and the ear wires are gold filled. They have a lot of movement and I have to admit that I have already adopted them. Neat earrings, congrats on your class win. Hope you have lots of fun with that. Neat earrings, congrats on your class win. Sounds like lots of fun. They were hard to resist, right? Beautiful earrings! Your class sounds like it will be fun. Good luck w/it!